Welcome back to Behind the Spells, the series that provides a historical background, secret effects, and related material for classic spells from the world’s most famous fantasy roleplaying game. The rules (presented after the “Spell Secret” header) are compatible with any 3.5/OGL fantasy game, and the background weaves the spell into the lore of the game’s previous three editions. 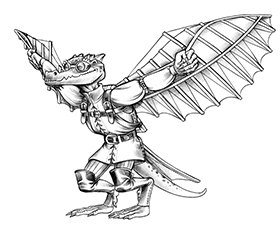 Each “Behind the Spells” release is narrated by an ancient gold dragon named Maxolt Alberiim. In the early centuries of civilization, warriors held yearly celebrations of physical prowess—games where leading warriors from allied nations could come together in friendly competition. Mages soon founded similar games for arcane prowess. The very first Magefair was in the Durantian capital of Thesktin. Among other activities, the fair featured a new spell competition. Both arcane and divine casters were invited to participate, and the winner received a sizable monetary contribution to their charity of choice. A half-elf conjurer of middling talent named Foran Poltt attended one such event and named himself as a contestant in the new spell contest. As a youth, the half-elf had no friends save for those he created with his own imagination. But he considered his daydreams the stuff of legend. Later in life during his arcane studies, one instructor commented that what Foran lacked in dedication he made up for in creativity. His imagination and loneliness inspired the spell he created for this contest—summon friends. Contestants had two days to fashion their new spells. During that time, trial and error in the spell’s creation showed Foran that his conjuring attracted more evil humanoids than it did anything else. The half-elf presumed the world contained more of those creatures than any other kind. Thus was born its description as summon monster, the name which endures to this day. It debuted to critical acclaim but failed to take first place (that honor going to the more utilitarian spell water breathing). Short story for this spell, yes? Well, the creation story is short but what happened later takes a bit of explanation. You see, the Thesktin Magefair became so popular over the next century that the infamous Council of Hebris eventually sponsored it; the Council was a collection of spellcasters who took it upon themselves to monitor the magical work others. Essentially, the council served as a check on new spells as well as a gossip hub for the spellcasting community at large. The council was recognized for its collection of talent as well as the library of spells it carefully cataloged over the years. When it became the Magefair sponsor, the council laid claim to all of the original spells created for the new spell contests (copies of which were always provided to Magefair officials). Many were the inane attempts of novice mages to reach higher than their grasp (the cranial desiccation spell comes to mind). The council wanted to clean up these blundering spells—tweaking them so that they might serve the common spellcaster and, thus, generate massive resale in foreign and domestic markets. Since all of the original casters were long dead, the decision harmed no one; or so the council believed. When Foran, now at the venerable age of 138, heard that his precious summon monster spell was slated for change, he teleported to the Council of Hebris. Despite a heartfelt plea and explanation of the spell’s intended purpose, the council deemed the spell “irresponsible” because of its indirect targeting. Many creatures summoned away from sensitive situations were provided as evidence against Foran. In at least two of the cases, the friend of a summoned being died because of the target’s absence. No, the summon monster spell had to be revised, no matter the creator’s nostalgic pleadings. After the council wizards finished with the spell, summon monster targeted only extraplanar creatures. It would take centuries, they knew, to make the change to the spell universal and, indeed, both versions existed for many years. Only recently does the current generation recognize the council’s altered version as the standard version of the spell. Foran died heartbroken that his spell would eventually lose exactly the element that made it so special to him—the power to summon real creatures he might later meet in life and call his friends. With a successful Spellcraft check (DC 20 + spell level), you can target summon monster on an extraplanar creature in your line of sight. If the target creature fails a Fortitude save, it immediately attacks its closest ally and continues attacking its allies until either the spell duration expires or it dies. The power of the creature (CR) you can control must be equal to or less than the level of the summon monster you cast and you can never target more than one creature in this way. [For example, if you were to use this spell secret against a Medium Earth Elemental (CR 3), then you must cast at least a summon monster III spell.] Creatures of CR 10 or more cannot be targeted by this spell secret. This spell summons the mental abilities of an expert in the area of expertise you name when the spell is cast. The magic targets an appropriate creature that is asleep or otherwise unconscious and then creates an illusionary image of their form at the caster’s side. The illusionary expert seems awake and can do nothing except answer one question per round to the best of its ability (assume a Knowledge skill check at the expert’s level+3). Once the duration has expired (or the caster dismisses the spell), the target recalls the encounter as though it had dreamt it. Summon expert can target any creature as long as it is on the same plane of existence as the caster. The level of the expert matches that of the spell (Exp1 for summon expert I, Exp2 for summon expert II, and so forth). Arcane Focus: A tiny mirror and a small (not necessarily lit) candle. Behind the Spells: Summon Monster is the fifth in a series produced for KoboldQuarterly.com by Tricky Owlbear Publishing, Inc.